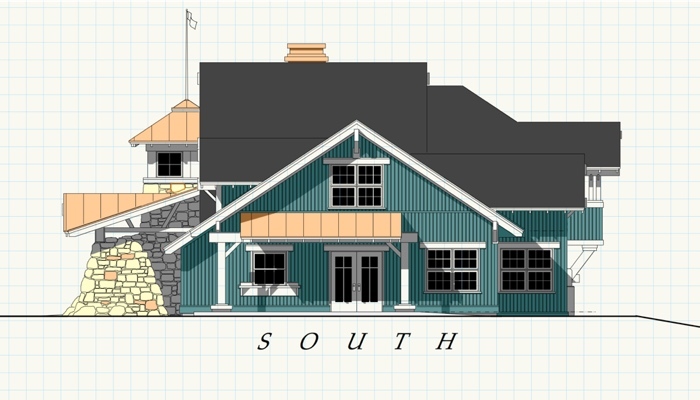 Preliminary design package for a clubhouse facility at a local new golf course west of Grand Rapids. Materials and visual clues harken back to a time when mining structures dotted the landscape. South Elevation (right side). Building is scaled down on this side to purposefully make the 'at the turn' experience (with the covered outdoor snack window) comfortable and memorable. Direct entrance into the indoor eating space is pleasantly presented. 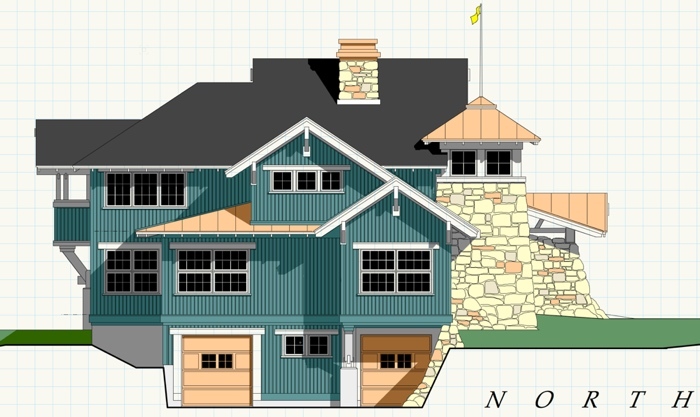 North (left side) Elevation drawn on CAD software. Site drops off allowing lower level access to cart storage, and maintenance. Jumbled, cascading roof lines add to the 'mines' character. The golf course side elevation (East) of the clubhouse looks out onto the 9th green, as well as the 5th tee to the south. A fun use of metal roofing continues the 'industrial' flavor of the design. High windows in the snack area create a wonderfully lit lodge-like experience. Front Elevation (west) drawn on CAD software. This is one of my favorite drawings of all time. Fun with offbeat materials: Corrugated metal siding, sculptural stonework, metal roofs, and a fun sporty quality that would enhance the community, which is what an urban golf course should exemplify. The Main Floor Plan, showing a direct progression inside to the check-in desk, with views of the course cascading downhill beyond. Retail to the left, snack area to the right. 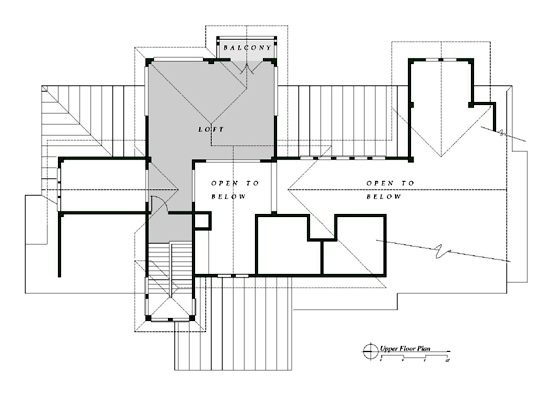 The stairs go up to a small gathering space for private affairs. 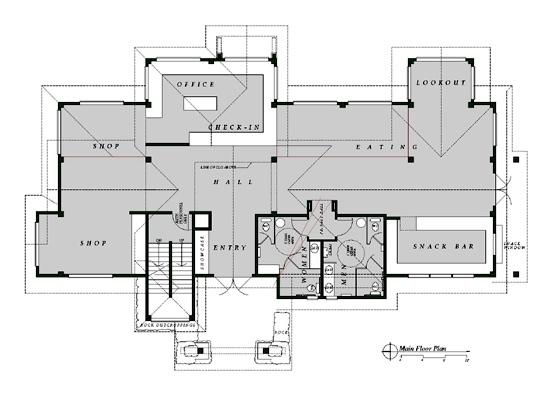 The Upper Floor Plan, showing the gathering space which looks out to the golf course to the east. The owner requested a small balcony for testing cigars.